This Braeval comes to me from Florin, the president-elect of Andorra, who I think recommended it highly. Then again, Florin is the source of 50% of the whiskies I have scored below 75 points so who knows what that means. Let’s get to it. Nose: Lime and lime zest with a bit of a herbal/rooty edge. A fair bit of malt too and sugar. Gets more peppery as it goes and a little bit grassy. Gets a little creamier with more time and there’s more vanilla as well; the lime recedes a bit. Creamier still with water and then the lime comes back. 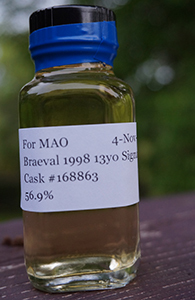 Here is another malt from Braeval, released well after the shift from the Braes of Glenlivet name. It was tasted right after the first (the 1977 from Glenhaven that I reviewed a couple of days ago). This was bottled by Chieftain’s, one of the independent labels of Ian Macleod who also own Glengoyne and recently Tamdhu. 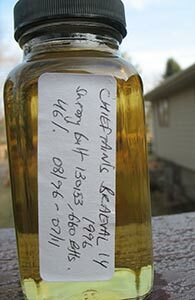 This was one of the first releases, I think, after Chieftain’s moved from 43% to 46% as their minimum abv. 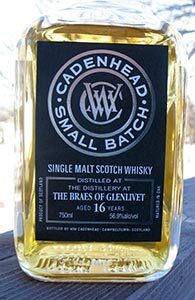 This is obviously from a different era than the Glenhaven; but it’s also from a different cask type than the Cadenhead’s 16, 1997 I reviewed last month. Will cask type or era make more of a difference? Let’s get right to it. Nose: Quite similar to the Glenhaven at first but much less intense: honeyed malt, some citrus and apricot and a hint of toasted wood and cereals. The fruit gets a little deeper with time. With a lot more time the gunpowder from the palate emerges on the nose as well but it’s not dominant here. Palate: Citrus first and then a wave of savoury gunpowder. Some hints of tropical fruit below that but it’s a little too thin. The gunpowder gets a little stronger and begins to cover up the fruit. Not a whole lot of development. Finish: Medium. A little metallic at first and then there’s the gunpowder. Comments: Well, this is not very much like the bourbon cask Cadenhead’s from the following year. At first it seemed like it was going to be similar to the 1977 but then the gunpowder showed up–especially on the palate. It’s not overpowering or offensive (though the sulphur-phobe might disagree) but it doesn’t work so well with the thin mouthfeel. And given the thinnness I didn’t add water tonight. Not bad–especially on the nose–but a little too simple–especially on the palate. I have now reviewed (and tasted) three Braevals, and found none of them particularly whelming. Ah well, more research needed. 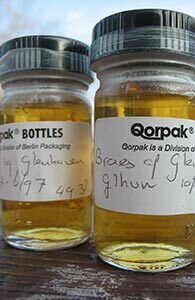 This is my second review of a malt from the erstwhile Braes of Glenlivet, now Braeval. I was not terribly enthused by the previous one, a 1997 vintage from Cadenhead’s. This whisky was released by the now-defunct Glenhaven and is from an earlier era. I quite liked an Auchroisk of the same vintage that they released at the same time as this and so I’m hopeful. Nose: Toasted wood, light caramel, cinnamon butter (is that a real thing?). Gets quite malty. After a minute or two there’s quite a lot of honey and apricot and the wood is more polished than toasted now. There’s also more wood spice and notes of rye in particular. Very nice. With a drop of water the maltiness expands at first and then the fruit gets muskier and creamier. Palate: Far hotter than I expected at 49.3%. The wood, malt, honey and apricot make the strongest impressions, roughly in that sequence. The apricot brightens out into something more citrussy (somewhere between lemon and orange) and there’s more bite from the wood spice on the second sip. And in general the wood gets stronger. Okay, let’s add water. Water pushes the wood back a bit and brings out a lot of pepper and some lemon. Finish: Long. The fruit leads out into the wood but it’s the malt that seems to linger the most. With time the wood trumps the rest. Comments: I liked this a lot on the nose but there was just a little too much wood on the palate and finish. It’s certainly not overly woody or tannic but just felt a little out of balance. While water pushed the wood back a bit, on the whole, I think I preferred it without. Not bad at all though and more evidence of how much good whisky is produced at unheralded distilleries. Braes of Glenlivet was the old name of the distillery now known as Braeval (read more about its history and change of name at Malt Madness). As with so many distilleries, Braeval’s malt goes almost entirely into blends and there are no single malt releases available other than from the indies. I’ve not had very many Braevals, and while none of the ones I’ve tried so far been bad, none have got me very excited. Let’s see where this one falls.